Mindscape in Words: Panchgani Journals. Today I'm posting a travel entry as a 'Throwback Thursday' post. I went on a short trip to Panchgani which is a hill station in Maharashtra during the first week of May. Even though there was heat as much as Mumbai, it was fun to visit the place. On the day of sightseeing, I visited five spots, all of which were wonderful. The first spot was 'Sherbaug'. Reaching by 3.15 pm, I spent around an hour over there. I was welcomed by water sprinklers. It was supposed to be a fun thing but it only frustrated tourists as their cameras and other stuff got wet. So, basically a lame idea. The inside was a huge maze-like area. There were trails surrounded by trees. Apart from the fact that it dreaded maintenance, it was quite alright. A touch of nature for the city-crazed people. There were rows of beautiful flowers at the beginning. There was a horror house, a laughing house, a huge water park area and a fossil museum. Here are some snaps from Sherbaug. The next spot was 'Sydney Point'. 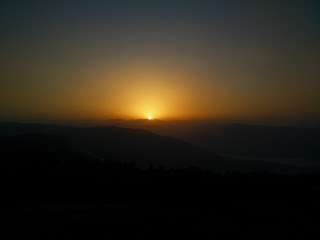 This was an amazing spot from where the view of entire Panchgani could be seen. The landscape was absolutely breath-taking. Unfortunately, there was a huge tower destroying the view which forbid me to take a panorama image. 'Ghatjai temple', praying destination was my next halt. It was deserted at the time. But, it is packed with devotees during festivals. Thankfully, I enjoyed the little peace and quiet before I headed to 'Parsi Point'. Here, the view was astounding. The place was full of tourists and vendors. There were shoe vendors, ice cream sellers, food outlets and so on. I enjoyed the wonderful breeze for a long time. It was such an amazing place. A place where I could stay to think, meditate, enjoy the scenery and absorb the view in my eyes as much as I could. I reached the last spot 'Table Land' by 5.30 pm. This was indeed extravagant. The land spread as far as I could see. I walked around a lot. Stopped sometime to just view the bountiful landscape and ponder over its beauty. The place witnessed people walking, some standing by the edge, some horse-riding, some clicking pictures etc. I didn't go all the way to the end as it was time for sun set. I headed back and luckily got a bench to sit. I clicked a lot of pictures during that solid half hour until 7 pm. I was ready with my camera to witness the perfect sunset but it wasn't quite so. The clouds in between the sun and the mountains made it impossible to click at the perfect timing. However, it was a great setting. In fact, I saw the sun setting on my left and the moon rising on my right. It was glorious to observe such a wonder. A panorama of the place. At the end of the day, I was very tired but also elated. This thrilling place with abundant natural beauty made me wonder about the cemented jungle which I love so much. I adore skyscrapers, shopping malls and the electric buzz in the cities. However, the pure, pollution-free and traffic-free Panchgani made me love nature more. Just came across your blog and I love it! Always looking for fellow travel blogers. Looks like a gorgeous place to visit! Good. Brought back memories. You shd have mentioned the amazing boiled peanuts we had in the market. Thank you! Oh yes! They were delicious! I've enjoyed your blog a lot! Boiled peanuts? When I lived in the Philippines we bought raw peanuts and boiled the. Oh the memories! I loved them! Baren beauty is some of the most beautiful! I love picture posts, your blog always has a certain personableness that I think really sets you apart from others. Thanks for posting and keep it up!